The fretboard was broken and unglued, cleanly separed from the neck. I am still wondering what made this happen. From damages on the bridge (an easy reglue) perhaps the guitar just badly fall from a stand on its face. Also there was not a lot of glue between fretboard and neck, perhaps a factory default. Anyway, the neck itself was not damaged at all, except the clever previous owners let the strings in tension.. They were still in tension when I received the guitar... So you guess what the result was : a very bad bow in the neck. protect neck on every contact point with a smooth material : I use cork. You'll have to drink wine. use a rigid metallic rod. Mine is a rectangular section chromed stuff, from an old metallic desk. Use trial and error to determine *where* to place the clamp. At first, apply only moderate pressure, just enough to unbow neck to perfectly straight. The neck strength is different from its widest to his narrowest width, so the optimal place for the clamp is *not* in the middle. When you find the position to have it straight on all its length, apply more pressure to bow the neck the other way. On the picture you can see the neck touch the metallic support, with a bow resulting from the thickness of cork shim at each end of the neck. rlspt : cool, francois, nice work. love the desk leg straightedge. best use of junk lying around i've seen lately. kitchen kamikaze luthiery at its best. Incidentally, i agree with your falling on its face theory to explain the fretboard popping off. too bad the idiot left the strings under tension; the neck is obviously more vulnerable with the fretboard off. the fretboard can add an amazing amount of stability. 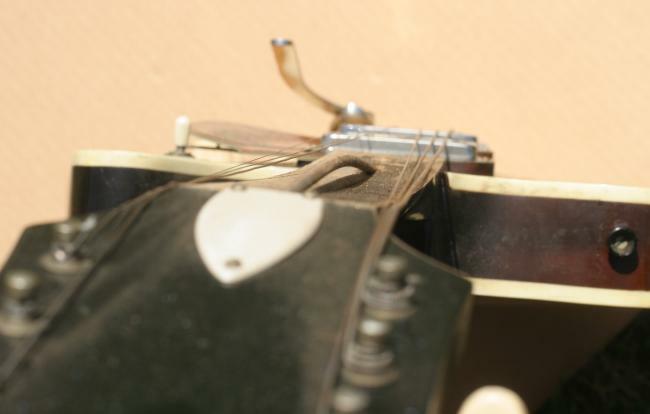 one remedy for neck bow is to install a new fretboard, slightly thicker and of a stiffer wood. especially clever luthiers introduce a curve into the new fretboard to counter the curve of the neck. i've also heard of remedying the curve of a neck by refretting the existing fretboard with new frets with a slightly thicker tang- setting the frets forces each fret slot open ever so little, lengthening the board enough to counter the neck bow..
Michael : It also works the other way around (thinner tang for a back-bowed neck). Dan Erlewine describes the technique in his book. rjones652 : Hi Francois, would the same technique work on a twisted neck? I have a Kay artist that has a rise on the high-E side and a drop on the low-E side. On any guitars, the wood works in tension through the years, a certain amount of bow is created, but, more or less, it stops to a stability point. If you do a reset (unglue the neck, sand the contact joint, reglue the neck in the correct angle), the neck itself is untouched and will not bow more. ukdenis : I was thinking about trying this technique on the old neck of my H54 without taking the fingerboard off. What does anyone think? Seems to me like I might end up with a neck I might be able to ebay - I realise there's a lot of "mights" in there!! What does anyone think ? Howmany : Fixing that Rocket neck is definately worth a try. I used to do repairs in a music shop years ago and we had the same type of rig as Francois is showing except that it was an electric plug-in unit that sat on the fingerboard/frets and heated up the whole thing. Not hot, not luke warm....just warm-hotish. We would clamp and the neck would be good as new the next day....maybe 2 days. Worked every time! I just checked Stewart MacDonald but didn't see one of these neck irons there....I thought I had seen one earlier....maybe I just can't find it. I suppose a person could add some heat with a lamp to Francois' rig if you were careful. Snapcase : Heeeeeeeeeyyyy !!!!! I want this !!!! Too many bowed necks around, some quite playable, some barely. I don't care how much would this thing costs. Take two guitars to the luthier to correct the neck and sure it costs more than this gear. I'll buy it. ukdenis : I emailed Aria in the UK about their straightener - got the reply just now. The recommended price is �410 - give or take $900 dollars. I think I am going to try something else. Howmany : $900....that's outrageous! There's gotta be one available for under $200.....we must keep looking! raz : $267 from lmii.org ? 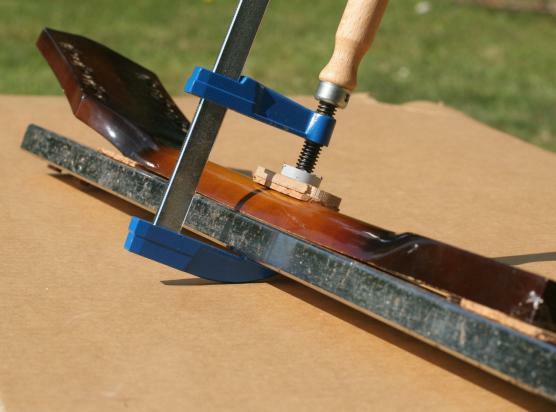 Fran�ois : Quote : "The heating element in the neck softens the glue joint between the fingerboard just enough to allow it to shift and then cool while clamped in the desired position." raz : I've been toying with the idea of buying one for a while... while not effective for correcting bowed necks, I had the though as well that a pet electric blanket that you buy at one of those overpampered pets stores might work to help loosen fretboard glue and might be a lot cheaper. Howmany : I wonder what would happen if you just had a rig like Francois'....a metal bar the width and length of your neck and/or fretboard, and just used a household iron on it to heat it up. It would be time consuming and you couldn't leave it unattended.....but....hmmmm. bug music : Anyone tried this method ? No need to even heat the glue. Snapcase : Leaving glue appart. Heating and pressing wood to get it in-shape makes a lot of sense. Just think about rims. They're shaped by heating them. The same with archtop pressed tops and backs, they're heated and pressed to get the proper arched shape. 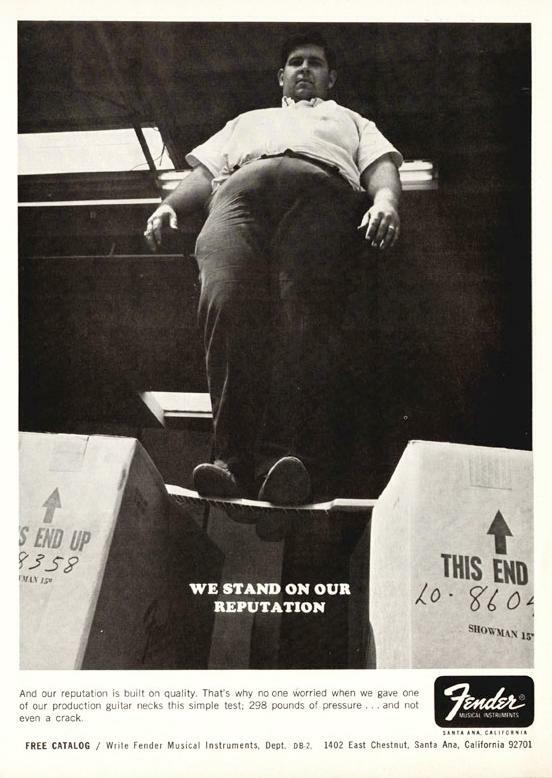 I think Lester's boss knew what he was doing with those bowed necks.